This post was originally written in 2016 and published on The Huffington Post. For some reason, anyone capable of whipping up a fairly decent loaf of bread seems to be elevated to the status of culinary genius. Now, I will admit that it can seem a little daunting, but isn’t that the same about anything you haven’t tried? I would much rather bake bread than cupcakes; to me, the chances of something going wrong are a lot higher with cakes than bread. Yes, bread making is methodical with plenty of science behind it, but if you follow the cardinal rules, it isn’t difficult. 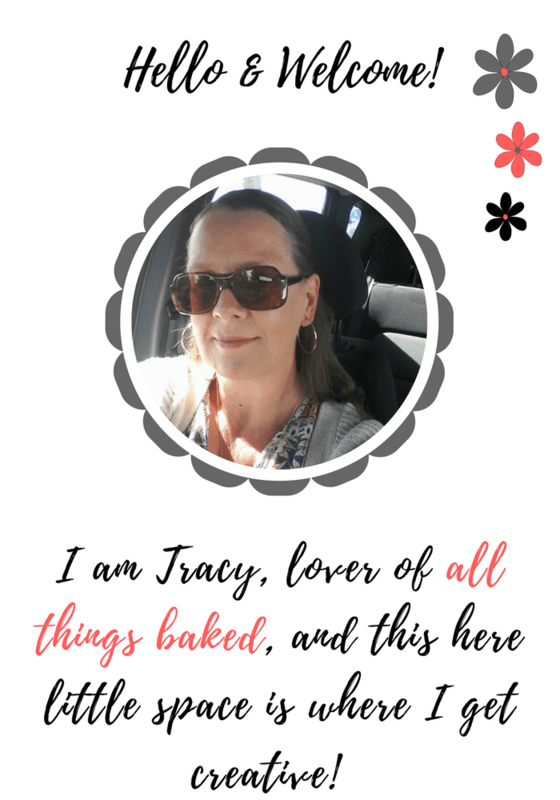 So, I’ve decided to share how I make bread. Yes, I am aware this has been done a million times before, but by people who are qualified experts, which I am most definitely not. We all know that trained bakers can make a decent loaf, but what about us average Joes just trying our hand at good old-fashioned bread? I am also aware that I am a new, paid up member of the bread machine club. However, not everyone seems to find them as helpful as I do. So this is for you guys. I want to encourage people who may have wanted to try but felt it was too complicated, or out of their reach. We all love watching the masters at work; staring spellbound as they effortlessly come up with creations we can only wistfully sigh over. But how many people feel that what celebrity chefs come up with is beyond their capabilities? Well, if the people who read my blog are a good indication that would be loads. That’s not to say that I think I have all the answers, because I don’t. However, I am someone who makes bread regularly, has made tons of mistakes along the way, but does a pretty good job (cue trumpet fanfare). Does this qualify me to give out tips? Well, yes, I think it does. So, here we go. 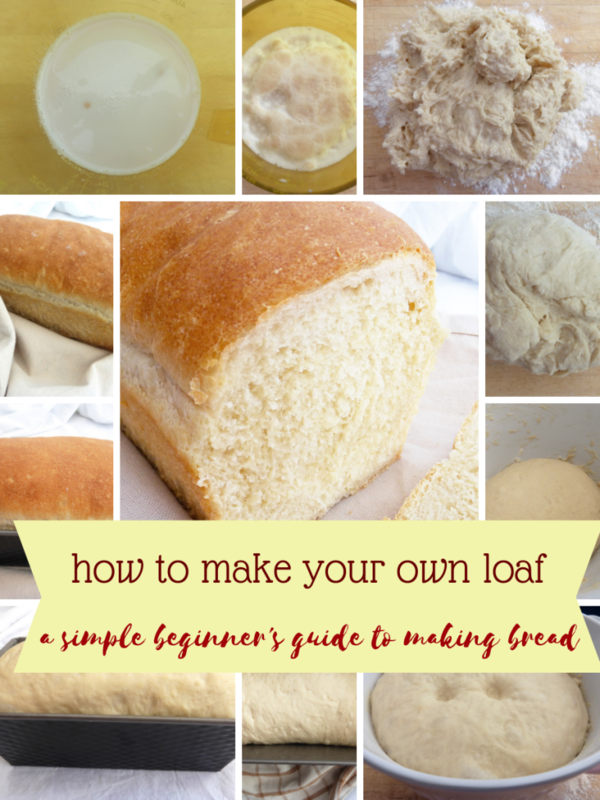 Simple steps towards making your own loaf of bread. Think of how proud you will feel. Go for it! 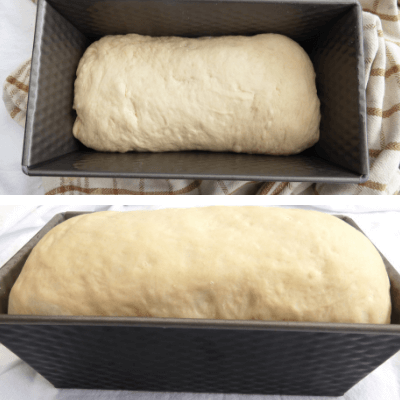 Once you’ve sussed out the basics, you can experiment – all the bread featured in this post has been made by my own fair hands. 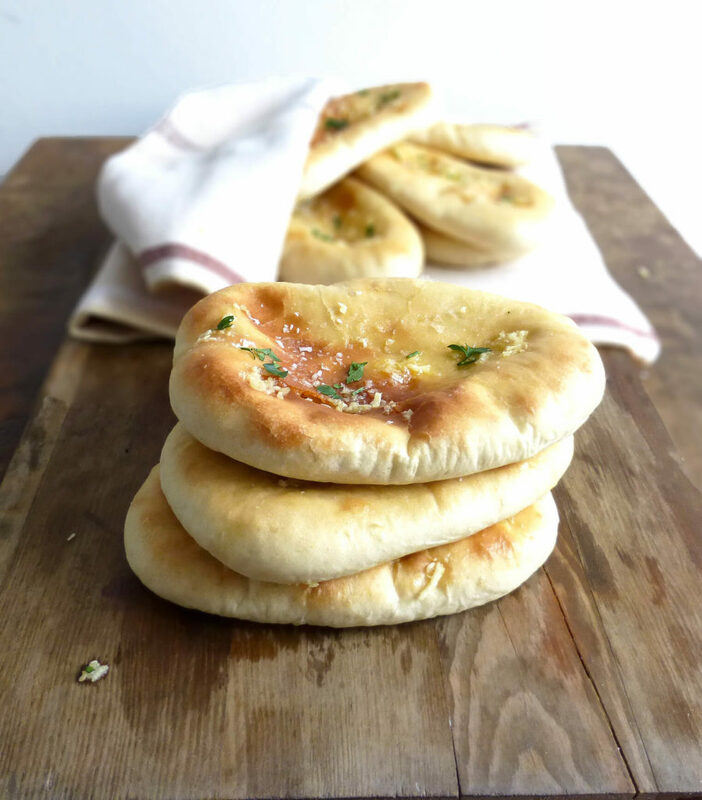 I use both fresh and dried yeast for my bread recipes but for this tutorial, used fresh. Many bakers swear by dried yeast (and in many cases, fresh yeast is just not available for everyone). I love the texture and smell of fresh yeast; it makes the whole experience for me. Check out this article from The Kitchn which explains the differences between dry and fresh yeast, and includes a helpful conversion. Yeast is very sensitive, especially when it is fresh. It needs warm liquid to activate but if it’s too hot, you will kill the yeast (and you don’t want that to happen). On the other hand, if it’s not warm, it will never activate, which could mean flatter, stodgier bread. Yeast needs to be given time to activate. After adding it to your warm liquid (whether that’s milk or water, or a combination) put it in a warm place for just ten minutes or so. 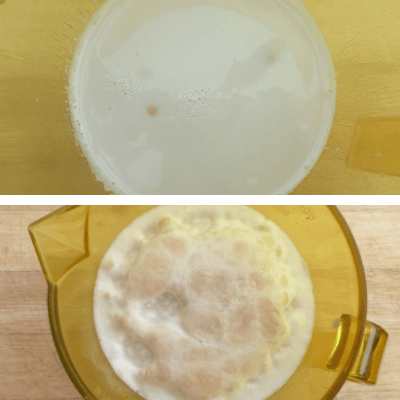 The first picture below has just had the yeast added, the second was ten minutes later. Pretty amazing, eh? Bread can be made with all kinds of flour. I always used strong (bread) flour until I realised that spelt flour makes an awesome loaf. 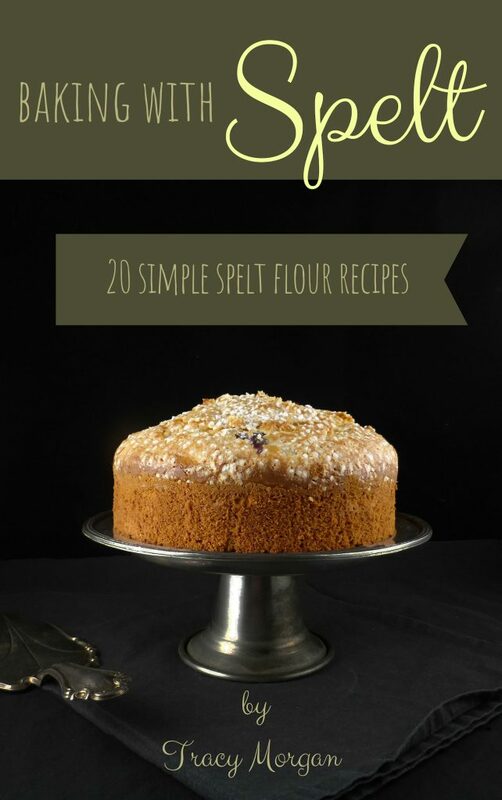 Some people even use regular plain (all purpose) flour. 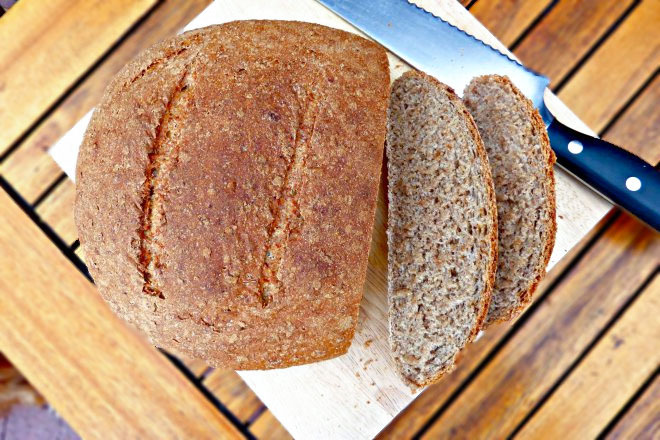 I love spelt flour in my bread but I think that the bread is lighter when strong flour is used. Every newbie bread maker wants to fling in tons of flour. Out of all my tips, I would say how much flour you use is the most important. People are just scared witless of sticky dough but too much flour can result in dry, dry bread. Not good. Only add a touch at a time, because you can always add more, but you can’t take it away. 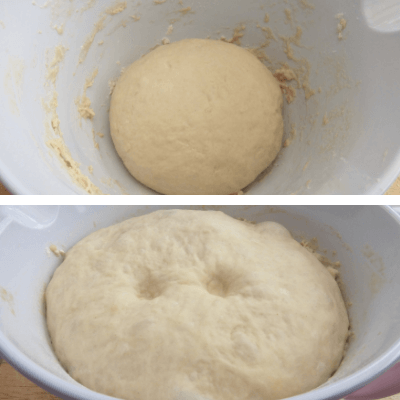 So, in case you didn’t quite get it: your dough should be STICKY, just like the first picture below (the second one shows after a little more flour has been added during early kneading). The ingredients to make a standard bread are pretty uniform. You will need bread flour and yeast (see above), some kind of fat (I invariably use olive oil or butter depending on the recipe), salt, sugar (any kind) and liquid. That is it. The sugar should be added to the warm liquid at the same time as the yeast, and the oil can either go in then too, or after the yeast has activated (I’ve done both and not noticed any difference). The salt needs to be mixed with the flours; never add it to the yeast as it can kill it (told you Mr Yeast was sensitive). 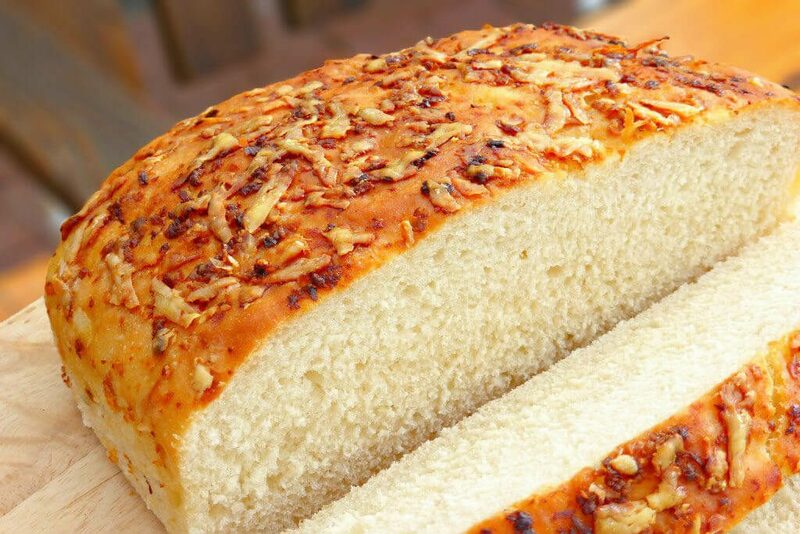 Once you’ve got your basic bread sorted out, you can customise it in any way you like, such as adding cheese and garlic – the possibilities are endless! We’ve all seen baking experts pummeling bread like there is no tomorrow, and again, they make it seem effortless. I know you are supposed to use your knuckles, but I just don’t like the sensation of sticking them into the dough (weird, I tell ya). I think the most important thing is that you are getting that dough moving, as this is what encourages the yeast to do its job. 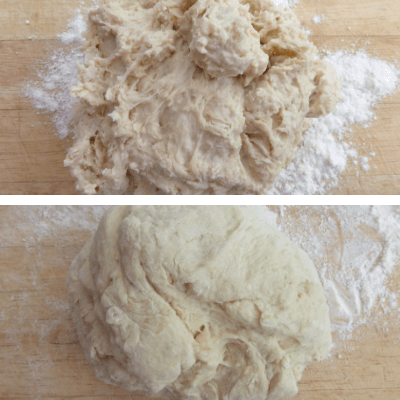 If you would like a little more help in knowing how to knead, take a look at this helpful tutorial from All Recipes. The end result should be a smooth, very pliable dough (first picture below). Most bread recipes require two sets of kneading: a longer session (usually around 8-10 minutes) before the first proofing and then again when the dough is “knocked back”, which means that the air is knocked out of the dough when it is briefly kneaded again (no longer than a minute). Don’t worry if your dough shrivels to the size it was before proofing, it’s supposed to, so don’t throw it in the bin thinking you’ve failed. Proofing is an integral part of bread making. If you want the best bread you can make, don’t be swayed by the “ready in five minutes” recipes. Confession time: I do use them – sometimes you just haven’t hours to spare to prepare bread, and for a midweek dinner, quick-fix alternatives are great substitutes, but really good bread needs planning and time, so make sure you have plenty of both! It’s impossible to put a time limit on the rising – the rule of thumb is that the dough should at least double in size before it’s ready. Some of my doughs shoot up like a rocket and have easily doubled in size within 30 minutes. Others are slower, such as heavier, denser breads made with wholemeal flour. Just take care, because, contrary to popular belief, it is possible to over-proof the dough, especially during the second proofing (and you will know because it collapses like a balloon with all the air suddenly expelled from it). For the first proofing, I usually leave mine for between one and two hours, but if you are still unsure whether it has risen enough, push your thumb into the dough. If the indentations hold but gently push back up a little, it’s ready. Always place the dough to rise in a warm, draught-free place. For the first (longer) rise, I put mine in the cupboard we have directly above the fridge. Then, when the dough is in its tin ready for the second proofing (which is generally a little shorter – between 40-60 minutes), I put it on top of the oven which is being pre-heated. Make sure you cover the dough with something. What that something is depends on who you are asking. Some say a greased piece of cling-film; others swear by a tea-towel. I prefer the latter, as it seems more rustic and true to bread-making roots to me, but find whatever suits you best. 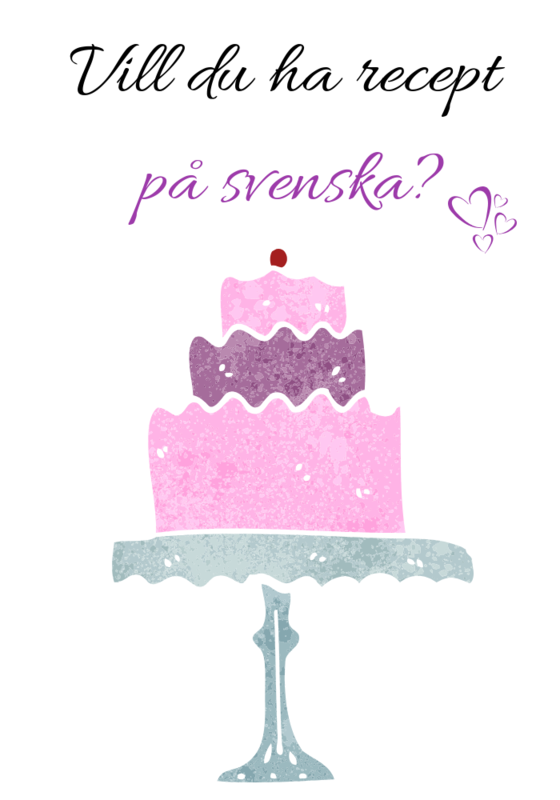 So, the moment of truth: baking. The oven temperature and cooking times do vary from recipe to recipe, but is usually fairly hot (between 190-225°C). Bake the bread in the middle of the oven and cook it until the bottom sounds hollow when knocked with your knuckles (it should be a deep, hollow sound and not just a dull thud). 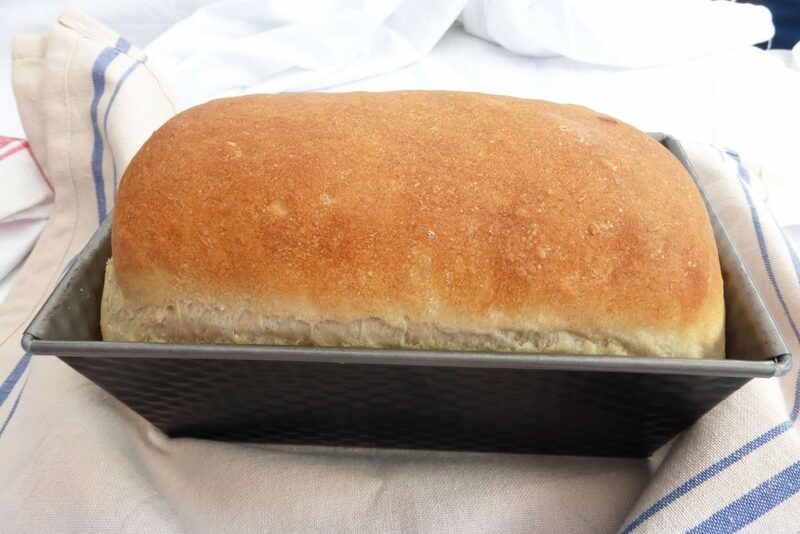 Bread rolls are so much easier to test with this method and getting a loaf out of a tin can be a palaver when it is so hot; however, if you get this bit wrong, your bread could end up stodgy and under-cooked or as dry as a bone. If you want crusty bread place a baking tray filled up to around the quarter mark, and place in the bottom of your oven. As it heats up, it creates steam, which in turn makes a lovely bread with a crispy crust. Alternatively, if you prefer a softer crust, cover the bread with a tea-towel immediately after removing it from the oven. So, that’s all there is to it. Think you’ve got it? Off you go then and make my simple white loaf bread. Good luck!